The walking and bike paths connecting Albany Station to Swanson Park now are part of the Albany park system, and that means park rules against drinking and drug use, among other things, apply. 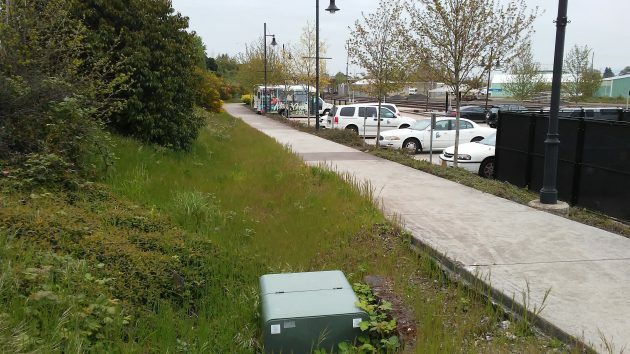 On April 26 the city council approved a request by the Albany police and the parks director to designate the “Swanson Park-Train Station Path as a city park.” The path is actually a system of two paths, one on each side of the Pacific Boulevard viaduct. Both were part of the project to renovate the train station and nearby underpass a dozen years ago. The path on the south side of the viaduct was completed in 2015, under an ODOT contract of about $384,000. The people I saw along the path on Monday afternoon weren’t doing any of those things, as far as I could tell from the bike, riding past. Ed Hodney, director of parks and recreation, told the council that signs designating the park would go up shortly. He estimated the signs would cost $1,500 total. The newer path starts here, at Albany Station and leads under the viaduct in the distance. 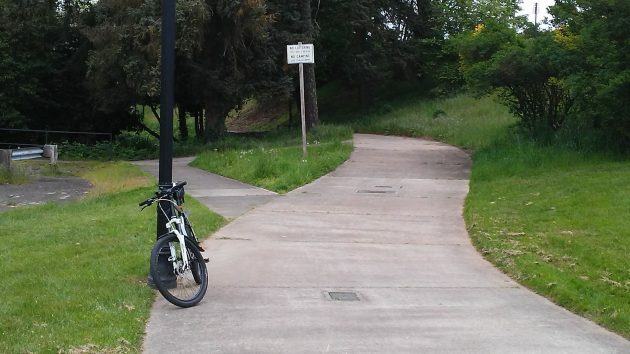 On the north side, the Swanson path starts near Lyon Street.